Today is Easter Sunday, and we have pretty much done it up right. In fact it all started about four days ago on what Episcopalians call Maundy Thursday, the day of the Last Supper. Embry read somewhere that Valencia was famous for its Holy Week festivals, which took place in the Maritime District, only a few blocks from where we are staying. The first big event was to be a parade of some sort; and around 8:00 pm as we walked over we soon heard the beat of drums—two loud, slow beats followed by three fast softer ones. Boom, boom, rat-a-tat-tat. Crowds five or six deep were gathered along the sidewalks of one of the narrow streets in this medieval part of town; and we squeezed in to witness a solemn procession of 25-30 people—mainly men but some women and a surprising number of teenagers and children– all dressed in black robes, followed by a band of drummers, constantly performing the same beat—boom, boom, rat-a-tat-tat. In front of them similar groups had already passed, and behind them were many others. The various groups in the procession were organized the same way—a leader in front, four or five in a second row, usually men, then a row or two of women, many carrying infants and then the teenagers and younger children. All the participants looked very serious, just like in a Sunday processional you might see at All Souls Church. And the people crowded along the sidewalks looked like church goers as well, with serious faces and very little talking. The only thing distinguishing one group from another was the color of their vestments, which included just about every color and combination of colors you could imagine. At the time we could not tell how large the parade was; but it went on for about an hour, and we figured we joined it somewhere in the middle of the parade route. As the last marcher passed, we fell in with the crowd and followed the parade for several blocks until we came to a small plaza situated in front of a Catholic Church where the action had paused and hundreds of marchers and drummers were standing around talking casually. Something was going on in front of the church—we could not tell what—but fortunately there was a bar next door. While I was taking photos, Embry grabbed one of the few free sidewalk tables and quickly ordered two beers. Then things began to take a strange twist. After remarks made at the church, all the adults in the parade put on large pointed hoods covering their faces, exactly like the Ku Klux Klan wear, reassembled in full hooded regalia and then continued the solemn march—boom, boom, rat-a-tat-tat. We finished our beers and headed home. It was close to 11:00 pm. What was THAT all about? Klansmen? The Inquisition? Executioners? 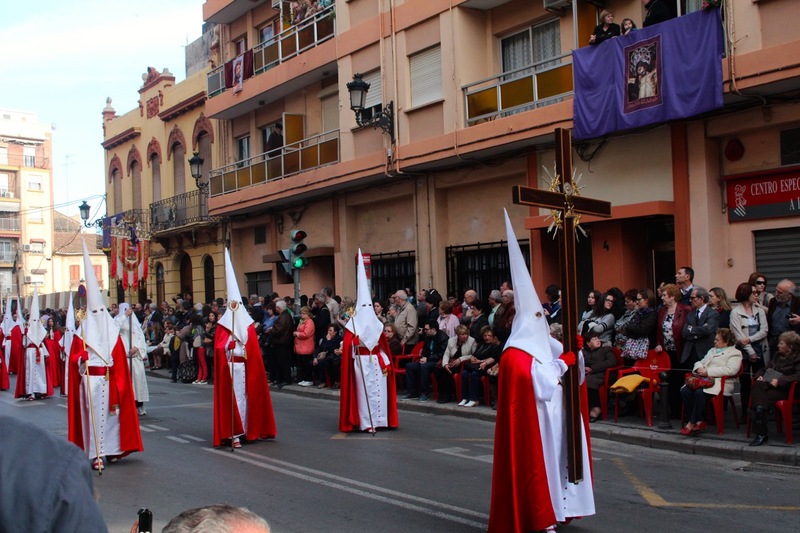 The parade the next day, Good Friday, started earlier, at 6:00 pm instead of 8:00; and by this time we had done enough research on the internet to learn that the pointed hoods were for those who were “penitent” and that this ritual had been going on since the Middle Ages. 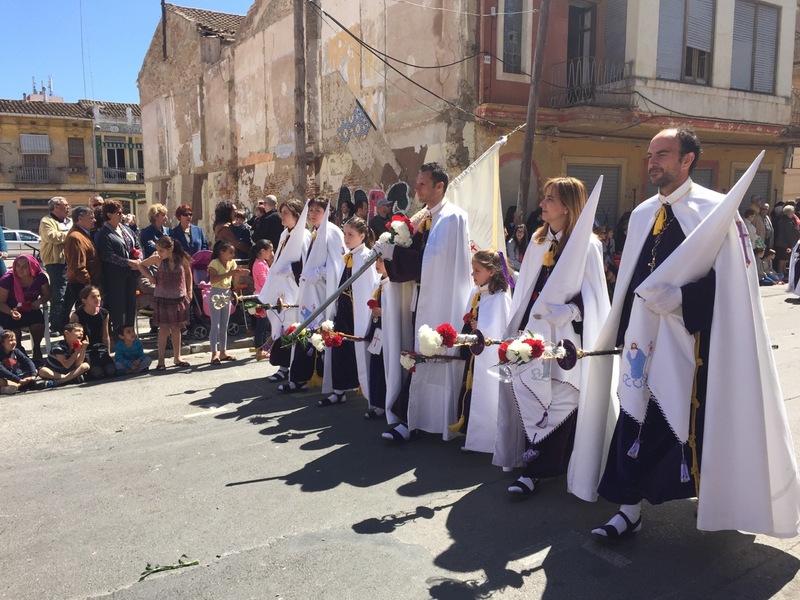 There were 30 different groups participating and 30 different bands, each one representing a kind of brotherhood or fraternity associated with one of the churches in Valencia . The most interesting thing for us was how many children of all ages, from infants and toddlers up, were involved. We did not know what to expect for the Good Friday parade. Having a little better idea of what was involved, we got to the parade route early and were strategically positioned at a plaza, near where the march got underway. This time the crowd seemed to be much larger and we could see various floats lining up depicting various scenes from the Passion. This march was like the first march in some ways—the vestments and robes seemed to be the same, and this time the hoods were worn from the start—but it was also very different in other ways. There were many more women and children; and everyone was dressed either in vestments or in costumes representing various Biblical characters—Jesus, Mary, Salome, Pontius Pilate, Caiaphas, Roman soldiers, various disciples, and so on (38 characters in all we later read in one of the pamphlets we picked up). Also this march moved very slowly with participants taking hesitation steps. Heads were bowed, faces glum and everyone, even the smallest children, in character. No one smiled. Ever. The bands had added brass instruments, and the music was one funeral dirge after another. The crowds were somber as well with few people talking and many showing expressions of awe. People were not crying, but they certainly could have been. The closest thing that I can think of is the mood associated with the funeral procession following the death of President Kennedy. And it went on and on and on. We left after a couple of hours, drained and exhausted. I was basically speechless. The final parade was today, Easter Sunday. We got there early again and this time wandered through the staging area before finding the parade route. The somber robes and vestments had been replaced by dazzling whites and the hoods were off. The atmosphere was totally different—upbeat, joyous, high energy and all kinds of colorful costumes worn by the women and children. And this time, again, everyone, even the smallest kids, was in character, grinning and smiling and tossing flowers into the crowd. The funeral dirges were replaced by upbeat marches and show tunes, woodwinds were added, and the pace was brisk. The crowd was the largest yet, well into the tens of thousands. We calculated that there were over 2,500 participants just in the parade! And along the route, there was hugging and embracing, laughter and joy. Everywhere. This time we waited out the entire parade and filed in with the crowd after the last marcher passed, returning to the apartment exhausted but smiling. I felt as if—perhaps for the first time—I had just experienced the passion, death and resurrection of Jesus Christ. And we also managed to get in a “real” church service as well, attending the ten o’clock mass at the cathedral downtown. It turned out that the big mass was at eleven; and the one we attended was in one of the chapels, the one with the guaranteed, real, authentic Holy Grail, a huge solid gold cup behind bullet proof glass. There was no music, and the service was low key and intimate. The chapel held about 100 people and was full. Even though we could not understand a word, the service was meaningful; and Embry was particularly impressed with the elderly priest, who had a kind smile and appeared friendly. I would argue that not understanding a word might actually be a blessing in some respects, but that is a subject for another time. The big service had already started when we came out of the chapel, and the huge nave of the Cathedral was mostly full by the time we eased out just after the Gospel reading. All of the service was chanted; and there were all the bells and whistles—incense, candles and clergy all decked out, an All Souls service you might say—on steroids. 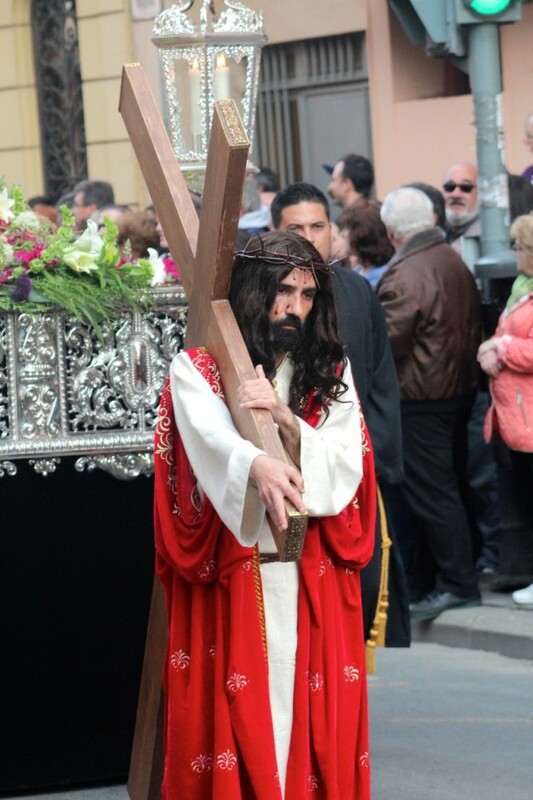 Quite a Holy Week here in Valencia. backing in large measure out of the Atonement Cross/Thorns/Blood/Gruesome Death THIS IS THE BIG EVENT IN MY LIFE, quoth Jesus deal. My Priest friend Pierre-Henri Brousson said: “The Cross was the consequence, not the intention.” My musing was drawn from Carl Jung’s comment to Sam Beckett: “I cannot cure you of schizophrenia, but I can help u weave the fragments of your life together.” Sam stopped drinking. Joe & Mimy this is marvelous. What open eyes you have… What a faithful, respectful, transparent rendering! And yet you left us with the enigma of it too: with the part (and with the whole) we cannot fully comprehend because we come from elsewhere. And yet it was also like a coming home – to something deeply shared, which was even more familiar for the strangeness of those masks and solemn faces – to Good Friday, Sunday morning, and to the path between them (which the processions followed) from dark to light, toward a festival millennia in the making. Toward the smiles of those children, who had been so stern. And to Something with a capital S which remains ineffable, and yet resides, in the background, behind everything. And to the sense, behind the words, of all they cannot say and yet reach for. You say it far better than. As always, thanks for your wisdom and support. Wow, what a way to spend the Easter Week. Sounds like you are enjoying Spain so far big time.